After our MOT disappointment we finally managed to get away. We said goodbye to friends in Exmouth (again) and had a night at home in Taunton; using the laundry of Mum and Dad to catch up on about four loads of washing, having a lovely home cooked meal with family and sleeping in a real bed (it felt a bit exposed as we’re now used to sleeping inside a box with no fear of falling out – well except through very unlikely circumstances). 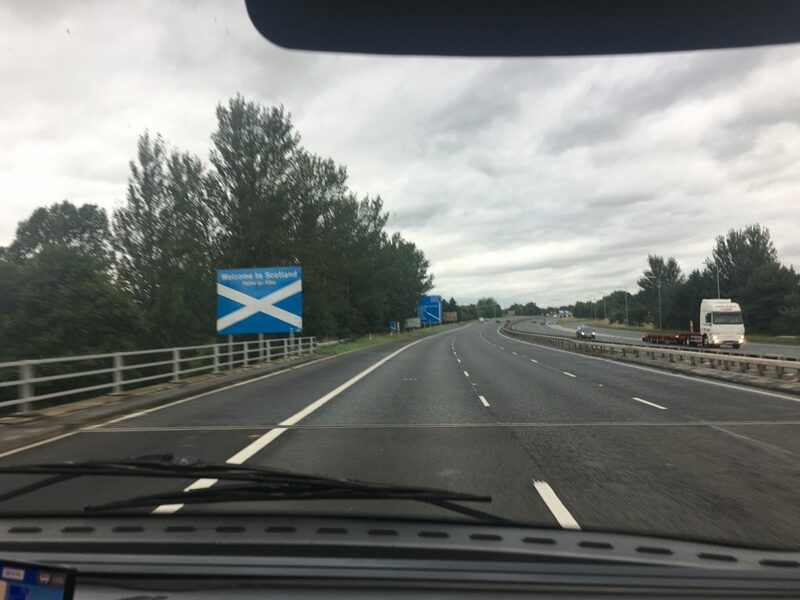 The next morning, fresh and fed, we made our way towards Scotland. This is the next part of our adventure and the rough plan is to work our way through Dumfries and Galloway, then across to Arran and from there to the Kintyre peninsular. Then we’ll see, plans have a habit of changing anyway. We didn’t know how far we would get. With Paul doing all the driving it was left to him to decide when to stop and how long for. In the end we had a couple of reasonably long stops for food and drink but made it across the border and ended up parked at Glencaple near Dumfries. When we got to our destination the rain was hammering down and the views were obscured by low cloud. 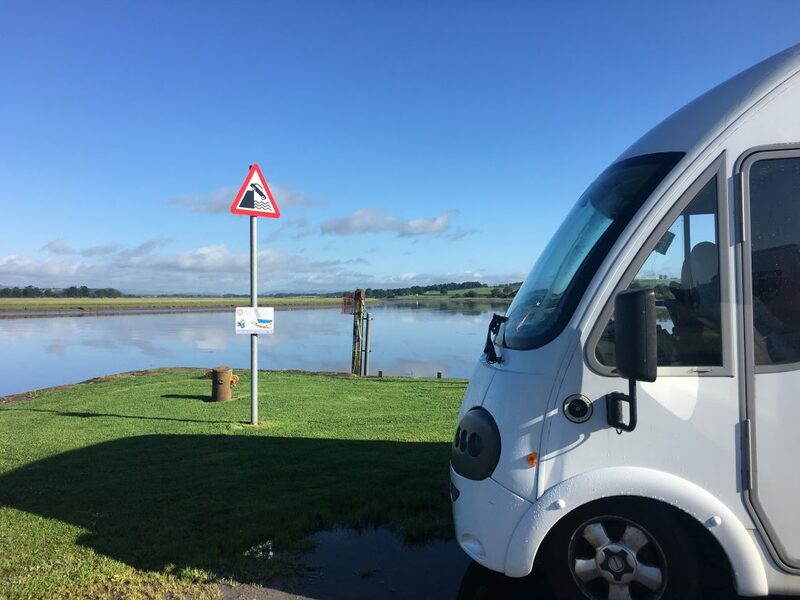 We could see the signs warning us not to drive off the harbour wall and the other signs warning of quicksand and strong currents – a place fraught with risk! But we could also see half a dozen other motorhomes and a welcoming sign inviting motorhomes to contribute via the honesty box. Something we’ll definitely do as it’s refreshing to find communities that welcome visitors. We had tea and went to bed listening to the rain hammering on the roof. The forecast was for pleasant weather the next day and that was good enough for us. On the journey we achieved a fuel consumption of 27 miles per gallon which is pretty good for Bertie. I think it’s probably as good as it’s going to get, but we have now started to record our mileage so we’ll be better informed, although possibly in this case ignorance is bliss.